I’ve been quiet about my first couple weeks of Ruby class, but not because of anything having to do with the class itself. It’s been hot in Seattle: the inside thermostat has been regularly clocking in at 90, and the last thing I want touching me is a laptop. Or a cat. Or any item of fabric. I’ve also been sidelined by a nasty cold. I am going to class and doing my homework though, because, priorities. 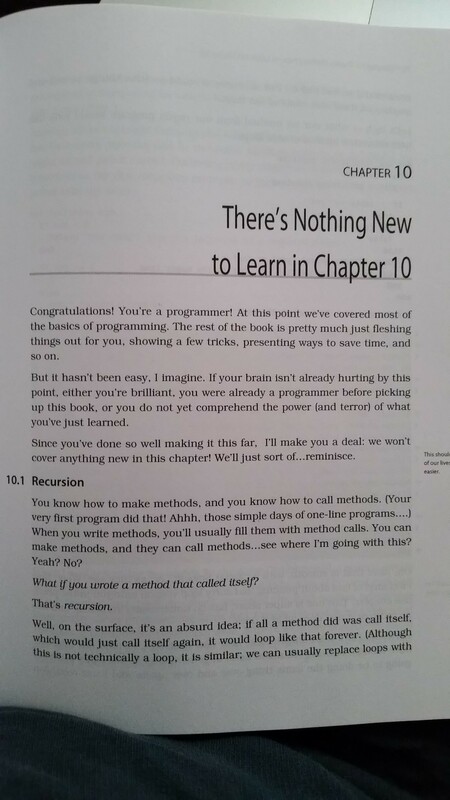 We’re using Chris Pine’s Learn to Program book, and I really like it. It’s a great teaching companion. For one, the book has great examples and challenge problems — they’re fun, whimsical, not too easy or difficult, and reinforce key ideas from the chapters. What’s more, they’re the type of programing challenges that a more advanced student could take and build on (make it better, make it live on the web, etc). But the BIG thing he does and why this is a Chris Pine appreciation post is how he handles recursive programing. In many programing classes, recursion is treated as A Big Deal and sometimes the instructor will make you go back and solve problems you already solved, but recursively this time. You’ll probably have to do a factorial. Through the course of trying to understand how a program can call itself, you may or may not get stuck in a brain loop that ends in expletives and alcohol. 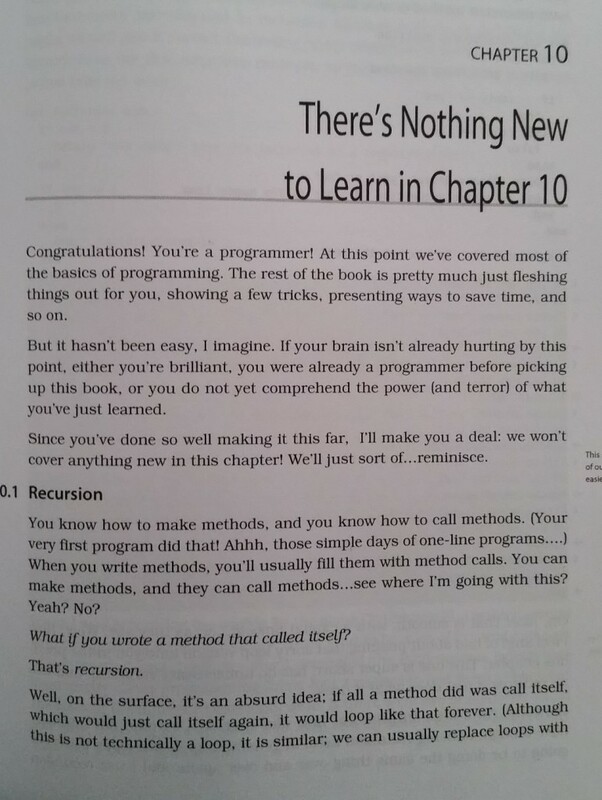 This is just so brilliant, from the title of the chapter and on. First he’s like, you got this. Relax. Let’s just chat a little, one programmer to another. And then he covers recursion, using a relevant example and–yes, a factorial. (He writes: “I’m feeling pretty rebellious, anyway, for not using factorials as my first recursion example, so look at this before the recursion police take me away:”) And then he gives a super cool video game example which I don’t wholly understand but it’s sure pretty to look at, and interesting enough that I’d like to figure it out. I wonder if she would have had the same reaction given a kinder, more gentler introduction to it. So this is just to say: I see what you did there, Chris Pine. And I salute you, sir! Into it? Buy the book. Good for beginners or anyone who needs a tune-up.